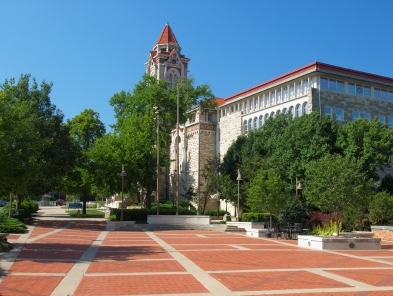 Proud home of the University of Kansas, Lawrence is a flourishing college community. The population was about 90,000 in 2008 and grew 13% from 2000. Lawrence is located near the northeast corner of the state. Those who want to live in a vibrant college town will find Lawrence, Kansas a stimulating community. The university’s 30,000 students give Lawrence a liberal bent and is the source for many cultural offerings. Lawrence has a radical library, microbreweries, a half dozen locally-owned coffeehouses, and an anti-discrimination law protecting gays. The city has a thriving music and arts scene; Rolling Stone named Lawrence one of the "best lil' college towns" in the country in 2005. Douglas County, where Lawrence is located, was one of 2 counties to vote for John Kerry in the 2004 election. Downtown Lawrence, in particular Massachusetts Street, has a lively atmosphere and is filled with restaurants, bars, galleries, shops, and music venues. The University of Kansas Jayhawks provide much local sports excitement. According to Zillow, the Home Value Index was $208,400 in early 2019, and called it a "Hot" market. The city of Lawrence is located near the northeaster corner of the state of Kansas. The Kansas River is nearby. There is a lively musical and literary tradition here. The downtown area is filled with bars, coffee shops, nightclubs, and galleries where music can be heard and art appreciated. The University of Kansas campus is home to museums, including the KU Natural History Museum, and the Spencer Museum of Art. The Lied Center of Kansas is the multimillion performing arts center of KU. Lawrence Arts Center is a vital part of the cultural scene. The North vs. South Music Festival is held each August to coincide with the anniversary of Quantrill's Raid (Civil War battle). Crime is above average in Lawrence - some of it college town related and some having to do with neighborhood. Kansas City (Mo) International Airport is about 45 miles. Lawrence Muni has multiple lighted runways for charters and private aircraft.